Natural gas processors and distributors are seeing an increasingly high-pressure environment in recent years, with mounting concerns over climate change and the future of oil and gas-related industries. 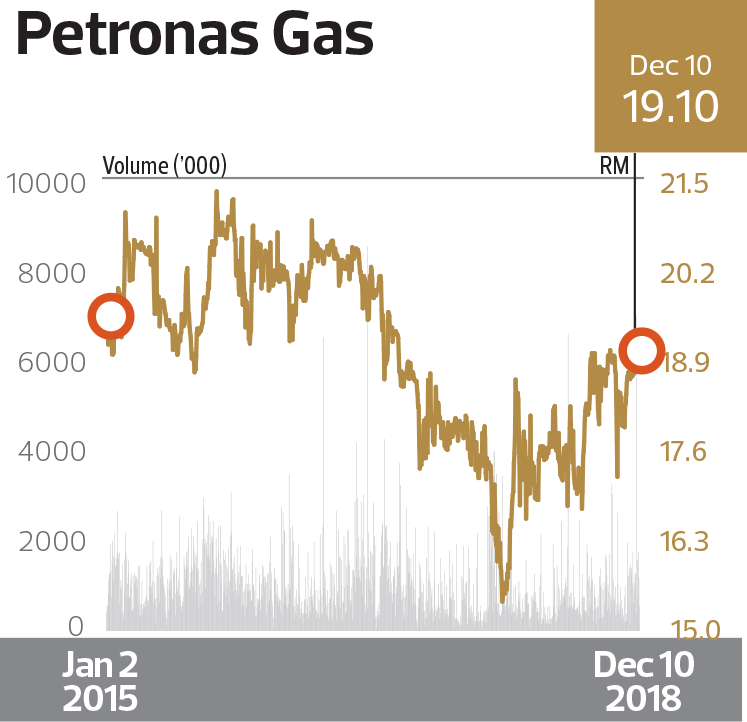 Petronas Gas Bhd (PetGas) has been evolving with the times to ensure its shareholders continue to reap good returns and to maintain its position as one of the country’s leading gas infrastructure and utilities players. Dec 31, 2017 (FY2017), it recorded a healthy ROE of 14.3%, easing from 17.5% in FY2014, even as shareholders’ equity expanded to RM12.52 billion from RM10.5 billion. Net profit, which grew from RM1.84 billion in FY2014 to nearly RM2 billion in FY2015, slipped to RM1.74 billion in FY2016 as the company recognised tax incentives from reinvestment tax allowances in the preceding years. In FY2017, net profit was RM1.8 billion. Its financial performance has remained steady and that consistency has supported its strong dividend payout, which hit 72.8% in 2017 (2016: 70.5%), translating into a total payment of RM1.3 billion, 6% higher than the previous year. While not affected directly by the low crude oil price environment, PetGas has been undergoing an internal transformation to ensure it remains competitive. By extension, the transformation also aims to ensure it continues to deliver value to its shareholders amid an increasingly dynamic and challenging landscape. In 2015, following the sharp plunge in global crude oil prices, PetGas embarked on the 3ZERO100 road map, its first transformation phase. efficiency and to strive for world-class standards in terms of productivity and health, safety, security and the environment (HSSE). PetGas has since embarked on the next transformation phase called 3ZERO100 Beyond, which builds on the operational improvements and HSSE achievements from the first phase. Looking ahead, PetGas could be facing a challenging landscape. In 2016, the government introduced Third Party Access (TPA) under the revised Gas Supply (Amendment) Act 2016, essentially liberalising the downstream gas sector. Ahmad in the annual report. Following several rounds of discussions and engagements with relevant stakeholders, he noted that PetGas was ready to offer the transmission and regasification infrastructure for use of third parties effective Jan 16 this year. “At the same time, we are further strengthening our internal processes and systems to enhance our competitive edge and ensure we remain the safest, most reliable and efficient infrastructure and utilities company,” he said. The TPA’s current tariffs are valid until the end of this year and the upcoming revision poses an earnings risk for PetGas, according to CGS CIMB Research. potential 25% earnings downside if book value is used as the regulatory asset base,” CIMB Research says. That said, CIMB Research expects PetGas to be capable of maintaining its absolute dividend per share quantum going forward by increasing its payout ratio to offset any earnings hit. As for the upcoming tariff revision and how it may impact its performance, PetGas expects to stay the course.